This series contains the proceedings of major scientific meetings held by the International Astronomical Union. Each volume contains articles on a topic of current interest in astronomy and astrophysics, giving a timely overview of research in the field. 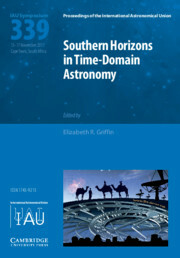 With contributions by leading scientists, the books are at a level suitable for research astronomers and postgraduate students.